Indonesian police have clashed with about 200 people trying to attack a mosque used by a minority Islamic sect known as Ahmadiya. The mob hurled stones at the mosque in Manislor village in Kuningan district in West Java, prompting an hour-long confrontation with police, a local Ahmadiya official said. “About 200 people pelted stones at our mosque and clashed with the police for about an hour. It is not clear yet who was the organiser of the mob,” Nurahim, the local general secretary of the sect, told the AFP news agency. Nurahim said the village’s 3,000 Ahmadiyah followers were ready to help the police if needed but would not respond to the violence. “We had a similar experience before in 2007, in which our mosque and houses were attacked. A house was burned and several were damaged at the time,” he said. The Ahmadiyah sect, which claims 500,000 followers in Indonesia, believes that its founder Mirza Ghulam Ahmad was the final prophet and not Mohammad, contradicting a central tenet of mainstream Islam. Ahmad claimed to be a reincarnation of Prophet Mohammad, a claim rejected by Muslim authorities and scholars. He also claimed to to be the Christian messiah. His sect believes that Jesus did not die on the cross, but he moved to India where he died at the age of 120. 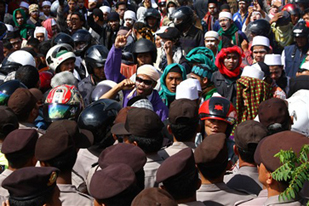 Indonesia’s top Islamic body issued a fatwa in 2008 describing the sect as “deviant”. Ahmadiyah has had a presence in the country since the 1920s.